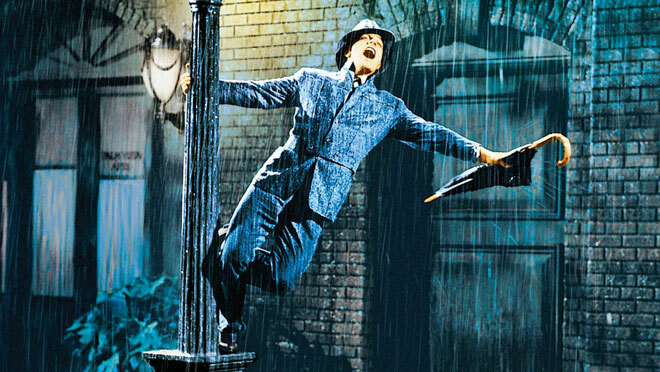 “Dignity,” intones Gene Kelly, a wicked gleam in his eye, “always dignity,” while whatever dignity Hollywood had is washed away in the movie’s artificial downpour. Feeling threatened by television and slightly irrelevant next to the explosion of world cinema, in the early 1950s Hollywood was caught up in a paroxysm of self-loathing as expressed by a rash of movies—The Bad and the Beautiful was the same year, two years after Sunset Boulevard—that ridiculed themselves. Produced by a Tin Pan Alley lyricist trying to get as many of his songs as possible into one picture (“All we knew,” screenwriter Betty Comden said later, “was that we had to work in a scene that had singing and raining”), this was, at best, a stealth masterpiece on first release. Within 20 years it would come to be regarded as the greatest American musical ever made, and nothing has changed that consensus since. The best measure of what’s irresistible about Singin’ in the Rain is that even without Kelly’s famous title number and Donald O’Connor’s demented “Make ’Em Laugh,” it would still be a wry and inspired satire; at the same time O’Connor’s preternatural optimism, former Miss Burbank Debbie Reynolds’s pluckiness in her first lead role, and co-director and star Kelly’s determined sense of joy suggested that Hollywood, having survived the transition from silence to sound—including the nerve-shredding screech of Lina Lamont, played by the wonderful Jean Hagen—would endure I Love Lucy and Kurosawa too.